Does Chambeyronia sometimes have green new leaves? If not, any idea what I have then? It’s about 2,5-3m tall ground to tallest leaf tip. The leaves have wide leaflets and are thick and leathery. 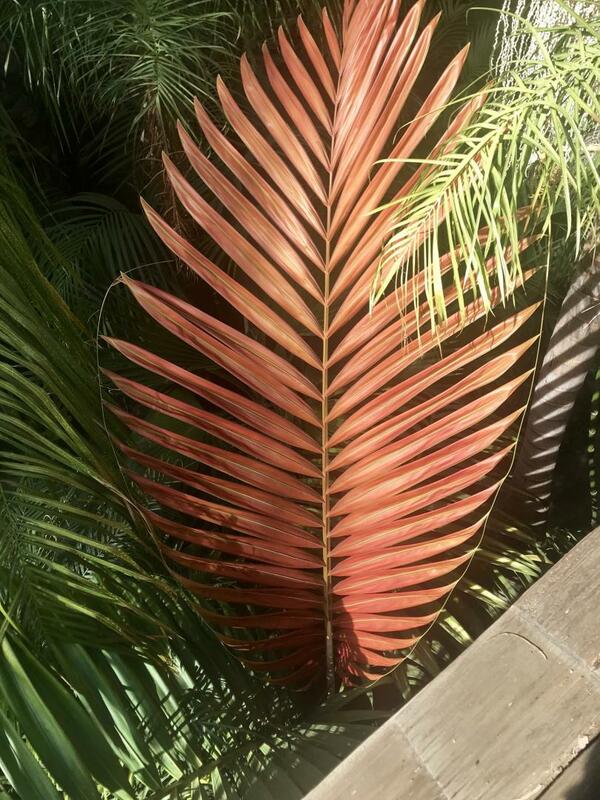 Yes, not all "Flamethrowers" are actually always red emergent leaf palms! I don't know if the green emergent is a random thing or not, but I've read that some of them will throw a green leaf for no apparent reason and then subsequent leaves are red emergent again. I suppose there's a reason, such as temperature, sun or nutrition. I have a "watermelon" seedling that just threw a 90% green leaf, with just some edging in reddish-pink. It's been struggling since I bought it as a bare-rooted seedling, so environment and plant health may have something to do with it. I have a trunking Watermelon that has always thrown green leaves, unfortunately. That’s not so bad then. Hopefully it will turn red. The next one is green thus far too. Are the emerging leaves red from the start? 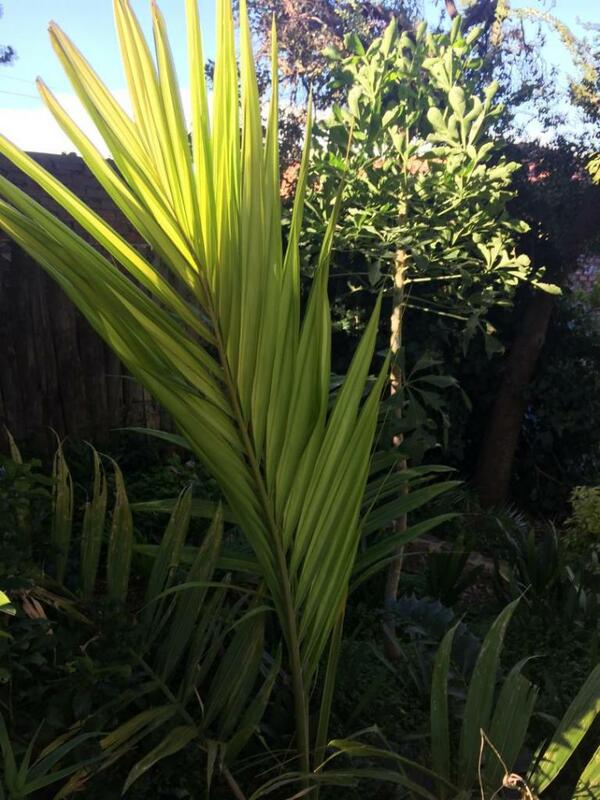 On my three regular Macrocarpa, the spear looks greenish with some dark edges. It isn't until it opens that it looks red. 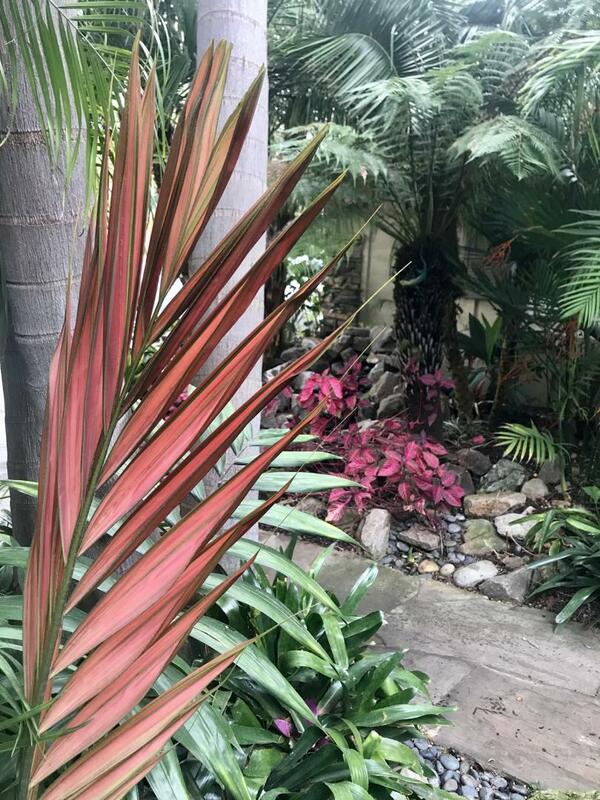 But mine seem to have green outer edges on the leaves and are red towards the center of each leaf, so the outside that's visible when the spear is growing are always green. I've seen others where the spear looks mostly red-pink while it's growing, so it may just vary from plant to plant. Never knew.....that’s for this info. I almost wonder if the red coloring is like sun protection for a newly emerging leave until it hardens off. I think I once read that red coloured new growth is to appear dead to insects and bugs that may otherwise be attracted to fresh, sensitive green new growth. Nope, it’s genetic, some populations on the island produce green leaves. Just the way it goes. Maybe through cultivated seed there might be crosses produced which will vary the green ratio but field reports illustrate populations in NewCal have only green leaves. I kinda like the green ones myself. Does Chambeyronia sometimes have green new leaves? I grow 1000's of the regular C. macrocarpa, and see about 2% put out green leaves consistently. You have one of the "rare" ones. Unfortunately, rare does not always mean desirable or expensive. Some customers prefer them. I have yet to see a green leaf shoot from a Chambeyronia "hookeri". Marius, Plant more of them. I have a dozen various Chambeyronia so there are red leaves several times during the year. Hi Jim. I think I should. I just want to see how this one does this winter. They do however appear to be quite hardy. 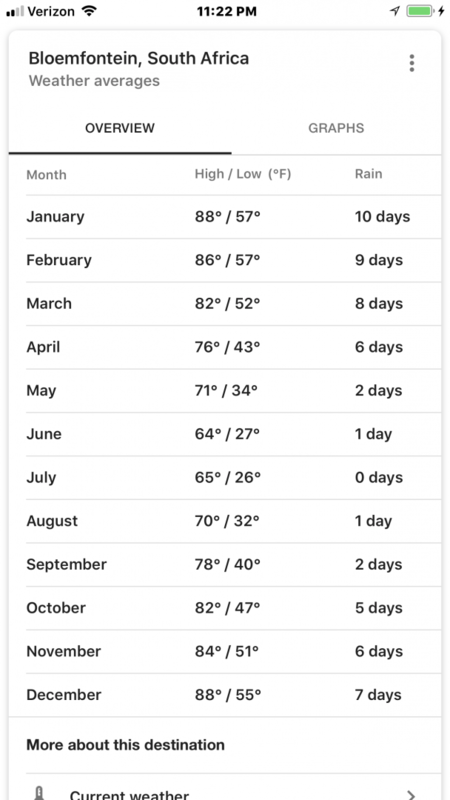 I’d be really concerned about May, June, July, and August. Those average lows would be very hard on a Chambeyronia. Low temperatures below average would likely kill it. They’re not frost tolerant either so you’ll likely need some sort of protection plans for your upcoming winter. My largest Chambeyronia macrocarpa is producing a bodacious crop of seeds. This Chambey is 25-30' tall and is one of the coveted 'Watermelon' varieties with streaks of yellow on its trunk and crownshaft. 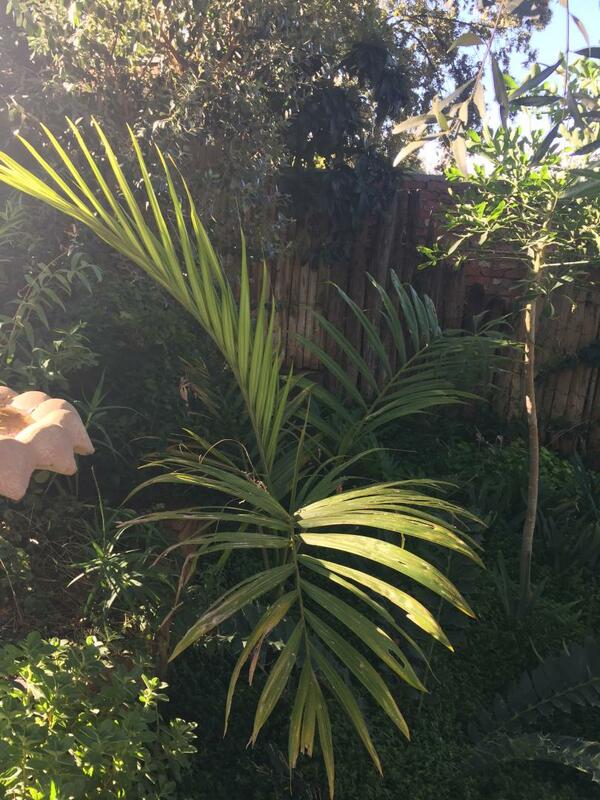 This palm is large and robust with leathery dark green leaves. 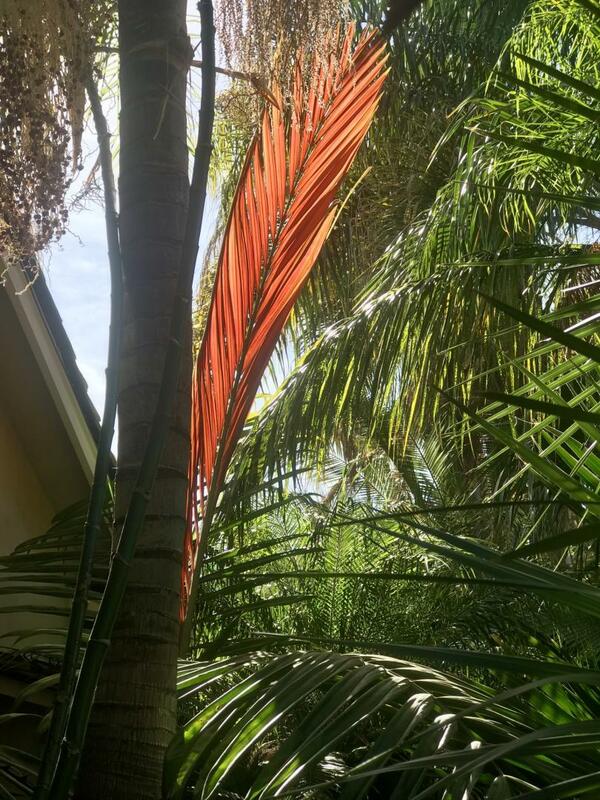 But its most astonishing feature is that new leaves open dark red to crimson before gradually fading to green, giving it the epithet "Flamethrower Palm." 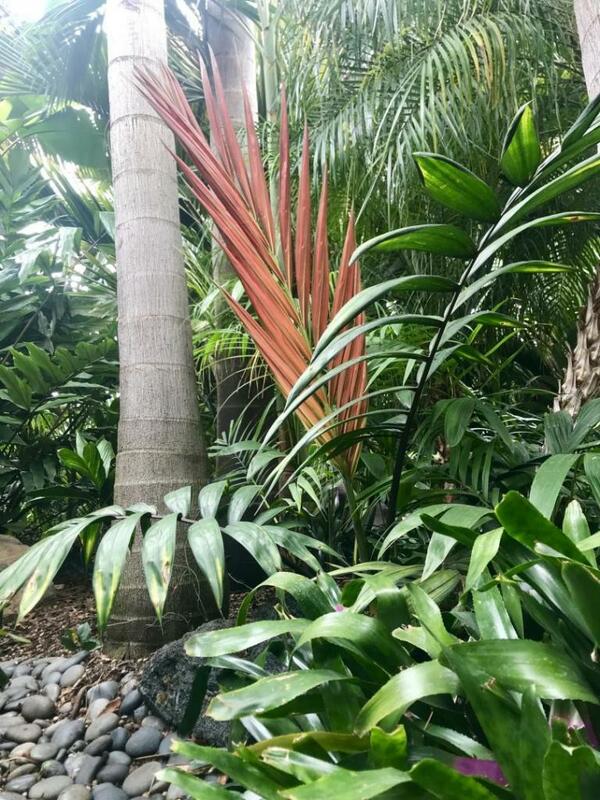 It is a spectacular, eye-catching palm from New Caledonia that is easy growing here in FL, unlike many other New Caledonia species. But it may be harder to find in the future as I've read that New Caledonia is cracking down on export of its native palms and seeds. If what I read is true, in the future only domestically grown seeds of this desirable species may be available. I have germinated a number of Chambeys from seeds and found their large seeds (~1" wide by 1.5" long) germinate easily and seedlings grow robustly. Now is your time to try this awesome species. Well you don't see this every day. I love it when a Chambeyronia opens a red leaf. Here is my biggest which I was told is a macrocarpa hookeri cross, but it may just be a yellow coloured macrocarpa because it's been much faster than any other hookeri I've had before. I am looking to buy a large Chambeyronia var. Watermelon or hookeri. Also interested in purchasing a large Dypsis Leptocheilos x Dypsis Decaryi (Tri-Bear). Let me know if anyone has these for purchase in any size (the larger the better). We got some much needed heavy rain yesterday evening. I looked out at my back yard jungle and noticed my Chambeyronia Houailou was sending up a new leaf. Houailous usually don't have as intensely red new leaves as the commoner macrocarpa, but this one is perhaps the most intense my palm has produced. 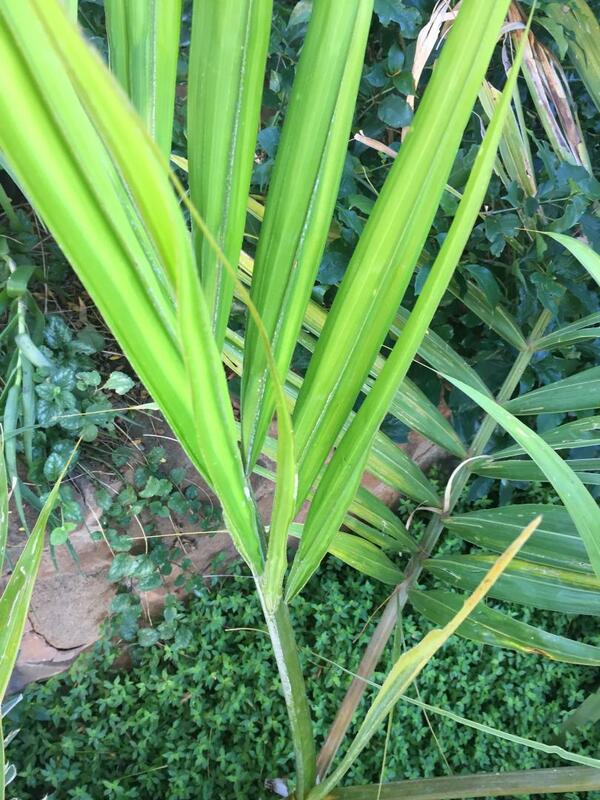 This sturdy palm with lime green leathery leaves is fairly slow growing for me but is finally as tall as I am. Great palm if you can find one. I took the next 5 photos this morning. One of them is of one of the palm's older green fronds.